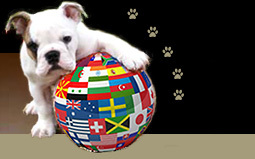 The Nordic group of dog breeds refers to the group of dogs originating from the Nordic countries, a term used collectively for the five countries in Northern Europe, known as Scandinavia (Denmark, Norway, Sweden) with Finland and Iceland. In addition, the following autonomous territories are associated with the term Nordic countries: Åland (Finland), Faroe Islands (Denmark), Greenland (Denmark). These dogs may or may not be of the Spitz type, the term "Nordic" referring to their country of origin, not to their type. There is some overlapping between the two groups, the Northern group being the larger one (including also breeds from other Northern countries and territories such as Alaska and Eurasia). Reversely, the Nordic group also includes dog breeds, which lay outside the Northern group or Spitz group, such as scenthounds, pointing dogs, and molossers. Most existing Scandinavian and baltic spitz dogs descend from Lapphunds. Norwegian Buhund (Norsk Buhund) : a typical middle-sized spitz dog with a courageous, energetic character. 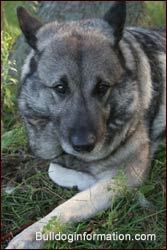 Norwegian Elkhound (Norsk Elghund): Elghund literally means 'moose-dog'. The Elghund descends from the Torvmosehund or Swamp Dog, bred by the ancient Danes. Lundehund: the most ancient of the Nordic dog breeds. The Norwegian Lundehund originated from the Lofoten Islands off the northwest coast of Norway. Scientific research indicates that the breed has been in existence since before the last Ice Age and probably a descends from the primeval dog, Canis forus, rather than the domesticated dog breeds, Canis familiaris. Its name means "puffin-dog" after the dog's talent for hunting and catching puffin birds (seabirds). Their strange anatomical features make them perfectly adapted to climb cliff pathways and manoeuver in the narrow crevices in pursuit of their prey. They have six fully developed toes on each foot providing them an improved grip when climbing; they can close their ear canals by folding over their ears; their head bends 180 degrees backwards over their shoulders and their extremely flexible forelegs can be stretched straight to the side. Hygenhund (Hygen Hound, Hygenstövare): the first part of the name Hygen refers to the breeder considered the creator of the breed. Jämthund (Swedish Elkhound), the national dog of Sweden, eponymous to Jämtland, a province of northern Sweden. Jämthunds have been companion and working dogs of Swedes since the end of the last ice age. They are used for hunting and sled pulling. They are also the National Dog of Sweden Swedish Marines and Air Force's official service canine. Swedish Lapphund: The swedish counterpart of the Finnish Lapphund, a reindeer-herding dog, today more often found as a companion dog. Swedish Vallhund (Västgötaspets): considered a native Swedish breed, although some similarities with the Welsh Corgi can't be denied. The Vallhund was already popular in the the 500's to herd cattle. Old Danish Pointing Dog (Gammel Dansk Hønsehund): an excellent retriever, descended from the early Spanish Pointer and Bloodhounds, brought from the Netherlands. It was saved from extinction after WWII. Coat has a white background, covered with brown patches and some speckling. Danish Chicken Dog (Danish Farm Dog): a versatile, medium-sized farmer's working dog. 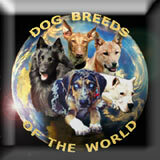 See dog breeds named after their foundation dog or in memory of another dog. Scandinavian Hound (crossbreed between Alaskan Husky and german or english shorthaired pointer). Note: the term "Nordic" and "Northern" dog breeds are usually used indifferently to refer to dogs of the Northern Spitz type. However, "Nordic" means from the Nordic (Scandinavian) countries,, and dogs from these countries include not only spitz-type dogs, but also pointers and other types of dogs.